Is the city of Athens planned? Or is it a huge accident? Athenians often describe Athens as a huge explosion of concrete and asphalt that nobody ever calculated (or even saw it coming). Has it always been like that? Is the city and its architecture so hard to tame and rule? The battle between what architects and planners hypothesized on their drawing boards and how the urban dwellers went on with carrying out building works without planning permission is not a recent issue for Athens. It has been present since the birth of the Modern Greek State in 1832. Greece’s first king, Otto of Bavaria, embarked on an ambitious attempt at redesigning his capital city as a showpiece for the grandeur of the nation, worthy of its ancient heritage. Under Otto’s reign European architects arrived in Athens to materialize his dreams of a utopia in neoclassical garb. Neoclassicism was a movement prevailing in the architecture of Europe and America which coincided and reflected the developments in philosophy and other areas of the Age of Enlightenment. Neoclassicism was initially a reaction against the excesses of the preceding Rococo style and was characterized by the introduction and widespread use of the orders and styles of classical antiquity. Nevertheless Neoclassicism in Athens was primarily associated with state ideology. Athens under the Bavarians was the political center of a nation state modeled on western ideas and founded on an assumption of continuity with ancient Greece; the neoclassical buildings of the new capital represented this continuity in architectural form. But the task that the architects had to accomplish was huge; Athens of the 1830’s was a former Ottoman town laid in ruins after years of warfare between the revolutionary Greeks and the Ottoman army. The medieval town, crowded mainly around the Acropolis hill, was built haphazardly and irregularly over ancient relics and evolved with no planning. Architects Stamatios Cleanthes and Eduard Schaubert proposed razing all of the old town to make space for archeological excavations creating an “archeological park” available for the education of all Europeans. The new reconstruction scheme was to completely change the layout and architectural style of Athens. 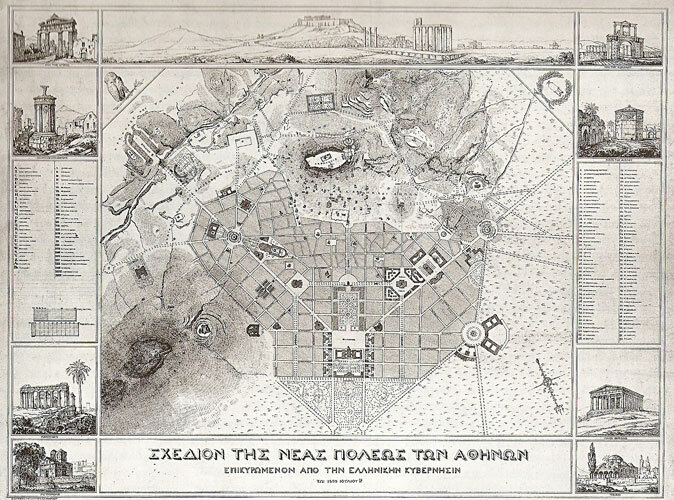 Their plan was to transform the Ottoman town into a city of the new neoclassical style, with a logical street layout, big squares, and with straight avenues offering long, uninterrupted views to the monuments of Classical Athens. This first plan proved to be overly ambitious and no large-scale redesigning was achieved due to high cost and reactions from landowners, whose lots were to be expropriated. Eventually the plan was implemented in a much more modest way than intended. 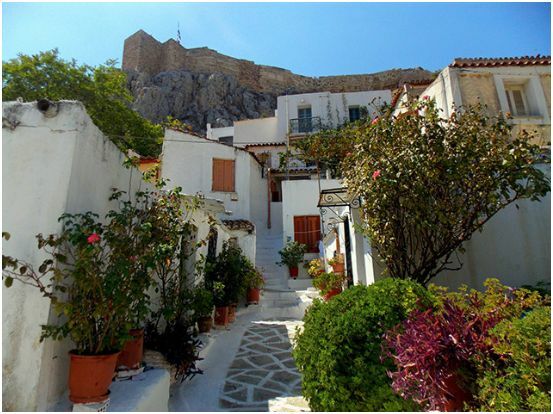 A big part of the old medieval town, today known as Plaka, remained as it was. The area managed to keep its irregular alleys and dead-end streets as they were centuries ago in contrast to the grid plan surrounding it. 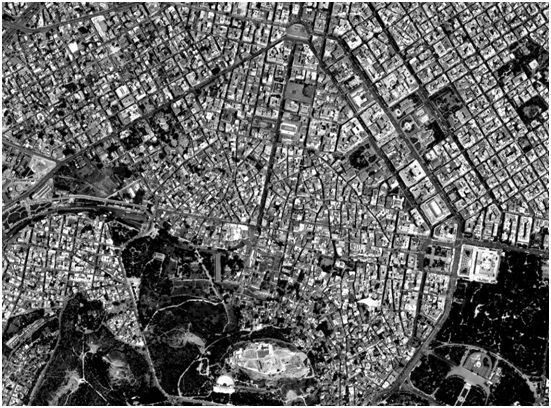 Athens as seen from a satellite today is a definite proof of the contrast. Viewing Athens from above you really start to understand that most of the narrow winding streets we see in Athens today were actually once the city’s main streets, and then the Bavarians came along and plonked their rectilinear, large avenues around of them (or on top of them). The medieval and irregular part of the city is renowned for its picturesque and often spontaneous architecture. When compared with the adjacent orthogonal city, it definitely seems as a completely “anarchic” situation. But even within the Plaka area, there are different degrees of “irregularity” that once indicated different boroughs and residential segregation within the same quarter. During the construction of the neoclassical monuments, craftsmen from all over Greece came to Athens to find work in the various constructions that were going on. Several builders from the island of Anaphi who were part of this inflow, found it impossible to buy land within the new city and settled on the northern slopes of the Acropolis. Ironically, the builders of the orthogonal and neoclassical city built something completely different for themselves. The neighborhood of Anaphiotika with its simple stone houses nestled right into the bedrock, whitewashed walls and cascades of bougainvillea, evokes the island life the masons left behind. When first constructed and for several decades the area was considered by the residents of Plaka as nothing but a slum. The old Athenian families of Plaka demanded of the islanders to restrain to their borough preventing them even from attending service at the parishes of Plaka. Nevertheless nowadays Anaphiotika is appreciated as a fine sample of traditional architecture and the whole settlement is listed and protected. The irregularity and the picturesque qualities of indigenous and ad-hoc architecture (as opposed to architecture made by specialists under specific principles) was of course in later years appreciated even by professional architects. The second half of the 20th century found architects from all over the world turning to the anonymous building traditions in search of qualities lost in architecture’s increasing rationality. In close proximity to Anaphiotika, on the hill of Philopappos, the Greek architect Dimitris Pikionis designed a series of pathways and pavilions that became an emblem of how anonymous or vernacular architecture can be incorporated in the works of professional architects. 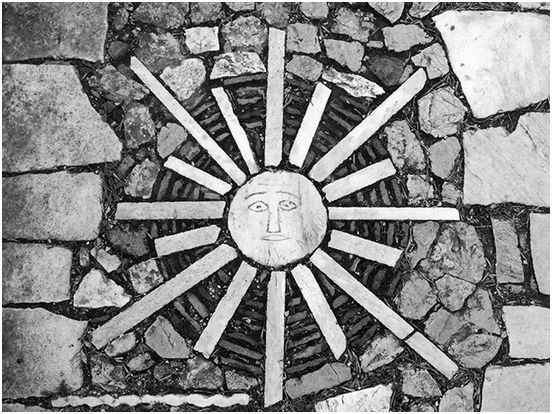 Over the course of 4 years (1954-57) Pikionis meticulously drew and executed various mosaics, pathways, seating areas and sheds that recall motifs of various building traditions from byzantine to Japanese. Pikionis was an adversary of a “universal tradition”, believing that all cultures had common roots. His work blurs the lines between “polite” and “indigenous” architecture, creating an environment that puzzles the visitor about the era that it was actually build. Parts of it seem rather modern, while others look as if they had been there for centuries. One of the numerous paths designed on Philopappos hill by Dimitris Pikionis, leading to a vantage point for the Acropolis. Various fragments of older buildings, or spolia as they are called by archeologists, have been incorporated in the designs of Pikionis, creating a complex mosaic of different parts of the city’s history. A fragment of a neoclassical pediment is placed on the ground and serves ad a furrow, while nearby parts of a marble monument have been turned into a bench. Bits and pieces of older buildings are reassembled to make an architecture that is definitely modern in spirit but, at the same time, historic in its texture. Zooming out again, one could say that the failure of the rational first plan for the neoclassical Athens was something far from an accident. This irregular city manages to retain and recall different parts of its past and constantly reminds them to its inhabitants and visitors. This odd puzzle is of course far from what we call rational or functional, but this mosaic of spolia-neighborhoods constitute a diverse and spontaneous city. Big Olive’s team devised a new guided walking tour exploring the formation of the contemporary metropolis and how it came to be as we know it today. Starting from the busiest part of town, the rational and monumental neoclassical city, this walking tour winds through the streets of the old town where narrow alleyways, hidden courtyards and ancient buildings are cobwebbed by time.This walk takes in a tiny Byzantine church entirely made of spolia, unique samples of the Athenian vernacular architecture, the tiny islanders’ settlement of Anaphiotika and finally examines Dimitris Pikionis’ experimentation with regionalism on Philopappos hill.